This weeks challenge at PaperTake is, Thanks a Latte, is to make a thank you card! There's an optional extra to use coffee and cream colours too (the Latte bit lol!). I think I may go back an make another thank you card later in the week using the coffee and cream colours. I never seem to have thank you cards on hand when needed, I must admit I am a slacker when it comes to sending out thank you cards so maybe if I keep a few on hand I will be forced to send them. The image is from an image swap on SCS. 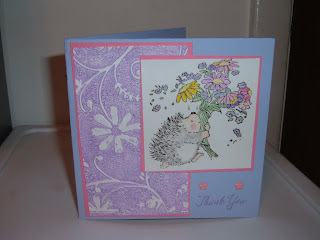 The embossing on the side was done on the cuttlebug using the Stylized Flower embossing folder, I inked it up with SU Orchid Opulence ink and ran it through the cuttlebug (I love this look). Awwwwwww...he's cute!! I love the embossing using the ink. I have yet to do this. Thanks! I took that pic last night. As far as what I colored with, my SU watercolor pencils. I didn't even do any blending. I LOVE it, Chrissy! That darling little hedgehog is one of my all-time favorites! Lovely card! Just toooo stinkin' cute is he!!!! And the inked up cb folder does leave an amazing bg!!! Such a sweet image and a great card. Aww I love that Hedgy. This is a gorgeous card. Very cute card and image. Love the image on your blog header too. That lil animal looking thingy is cute! !LOL!srry sis idk wut that is! adorable crissy. You are so creative i love coming over and seeing what you ahve done. How adorable is that hedgehog. This is gorgoues Chrissy. Gorgeous! I went to a scrap Saturday night, and someone there had an embossing "thing" but I didn't pay much attention as I already can't afford to get all the things I really want! Your card turned out so well, which doesn't surprise me. You're very creative.